Shavuot (“Weeks”) is just around the corner, and although it is a major Jewish holiday, it’s one of the least known. HISTORY Shavuot combines two ancient observances: a festival for the first grain harvest of the summer and the chag, or pilgrimage holiday, celebrated in Temple times. All Jews who were able traveled to Jerusalem to observe the sacrifices and bring the first fruits of their harvests, remembering and celebrating the covenant at Sinai. THIS YEAR Shavuot begins at sundown on May 14. Counting the Omer – Ever since Passover, we’ve been counting UP to Shavuot, building the anticipation for the holiday. Every night observant Jews say a blessing and announce the “count” of the day. Tikkun Leil Shavuot – How better to celebrate the giving of Torah than to sit up all night and study it? Many Jews gather to study the night of Shavuot (this year, May 14). Dairy Foods – It’s traditional to eat dairy meals on Shavuot, since if the law is newly given, there’s not yet time for meat to be kosher. In the Synagogue – We read from the Torah, we recite Hallel (a service of praise) and we have a special Yizkor (mourning) service. For service times, check synagogue websites or call ahead before the holiday begins. 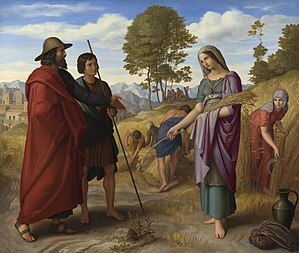 The Book of Ruth is the megillah (scroll) read and studied on Shavuot. Thank you for visiting my blog site. I am truly hoenord. Continued success and I count the days until your next visit.Be warned – I have a few feral liberal visitors who lack even the most rudimentary manners. I try not to censor them unless they go too far. They provide wonderfully demented examples of our political left.Continued success! Long live Israel! Previous Previous post: Can I Convert to Judaism Online?